Some 100 UN staff and more than 80 foreign diplomats have been evacuated from Yemen, following the night of intensive airstrikes by Saudi-led forces. 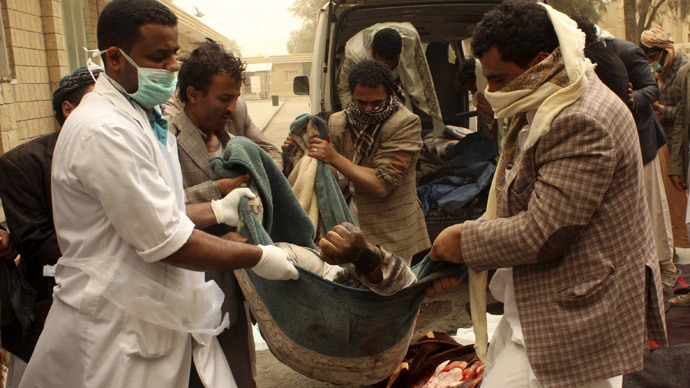 Twenty-four people were killed and 43 injured over the last 24 hours, the Yemeni Interior Ministry said. Among those killed and injured were Yemeni troops, police, security forces and civilians, the ministry said in a statement, cited by the state news agency Saba. Fourteen buildings were destroyed, it added. The deteriorating security situation has led to the United Nations evacuating its estimated 100 staff from the capital, Sanaa, Deputy Spokesman for the Secretary-General told Tass news agency. Saudi Arabian Defense Minister Prince Mohammed bin Salman Saud said earlier on Saturday that three Saudi aircraft were sent to evacuate a UN mission in Sanaa, according to Al Arabiya. The same news outlet reported that 86 Arab and Western diplomats were evacuated by Saudi Arabia's navy from Yemen's southern city of Aden. The evacuation mission involved two navy ships, as well as planes and commandos. The diplomats were reportedly taken to Saudi Arabia's Red Sea port of Jeddah. Massive evacuations were preceded by a night of airstrikes on the capital of Sanaa, described as “unprecedentedly strong” by a witness, who spoke to Sputnik news agency. The strikes were reported to have targeted military bases in Sanaa, including the base of the Yemeni Republican Guard and a missile depot. The airstrikes lasted “all through the night and stopped at dawn," a resident told Reuters. Early Saturday morning Saudi-led air forces attacked a convoy of Houthi armored vehicles, tanks and military trucks that were on their way to the port city of Aden in southern Yemen. Aden had served as a refuge to ousted President Abd Rabbuh Mansur Hadi, who fled Yemen on Thursday. Shiite Houthi forces shot down a Saudi Arabia-led coalition jet in the north of Yemen’s capital, Sanaa, Al Mayadeen TV channel reported, adding that a Sudanese pilot was arrested. Two Saudi pilots, who ejected over the Red Sea late on Friday, after their fighter plane suffered a “technical problem” were rescued with US assistance, Reuters reported citing Saudi Press Agency. The Yemeni Interior Ministry has in its Saturday statement described the Saudi-led airstrikes as a “flagrant violation of Yemen’s sovereignty”. All military units have been ordered to “intensify their combat readiness to counter aggression,” the statement said. Saudi King Salman meanwhile addressed the summit of Arab leaders in Egypt’s Sharm el-Sheikh, saying that the military campaign in Yemen against Houthi fighters would continue until its targets are achieved. Egyptian President Abdel-Fattah al-Sissi has called for the creation of a joint Arab army and said the military campaign in Yemen should last until Houthis capitulate.